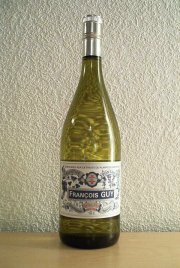 I had the opportunity to sample the Francois Guy thanks to Markus Lion at Absinthe.de. This is definitely very good absinthe. It's distilled and a nice light yellowish/green color. Upon smelling it, it reveals quite an appealing floral smell but a bit too heavy of anise. I must say that this far, the Francois Guy is among the best when tried neat. Tasted neat, it has a smooth, nice taste. Probably because it is at the lower alcohol level of 45%. And the anise takes away most taste of alcohol. The downside is that the anise takes away most other tastes aswell. When adding water and sugar to it, the taste smoothens even more, and it produces a fine white louche. However, at this stage the Un Emile 68 raises above the Francois Guy. It is tasty, but it lacks all the herbal characteristics of the Un Emiles and the Verte de Fougerolles. If it would be lighter on the anise, and rasied to a 68 degree alcohol level, I'd say it would compete well with the rest at the top. All in all, the Francois Guy is worth every cent it costs. I like it.